Our Toddler Community offers young children a loving and carefully designed environment that is primarily made for the needs of young children.Through own experiences, movements and discovieries, the children are invited into a warm, protective and respectful atmosphere in which the work of the individual is just as important as working with others. A community, where words are tools for communicating needs and desires, and in which the abilities of the child can expand in addition to his/her ever-growing self made experiences. By considering and supporting the natural inner drive of the children, they develop more self confidence and independence, while also learning the skills for respectful social interactions. Our Toddler Community has space for 12 children aged 0 – 3 years. The language materials include real objects and concrete miniature objects from the experience world of the children which can be expanded to abstract pictures, cards and books. Everyday communication as well as songs, stories and rhymes are just as important as musical and creative activities and of course the teacher, as the main language “material” in the environment, plays a very important role too. The children prepare the daily breakfast for the whole group. They also bake and cook. Preparing food is an important aspect that offers many different experiences (eg. Language, sensorial, movement). 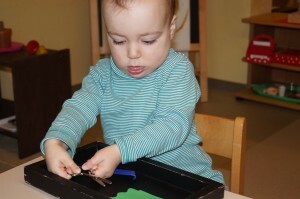 Sensorial material to promote eye-hand coordination, development of fine motor skills, understanding the principle of object permanence, socket-exercises, puzzles, etc. The outdoor area is looked after by us and the children together and serves both the free play and the exploring of nature with all senses. The outdoor area not only offers various working materials but also the opportunity for gross motor challenges. 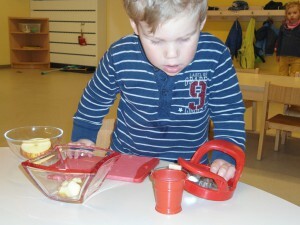 Children at a very young age are truly interested in daily schedules, chores and routines. They love reality and they want to participate in daily life and they see their parents as role models and want to imitate them. In our Toileting Concept the goal is not to have the children toilet trained as soon as possible. Rather we want them to have the opportunity to practice! But being dry at an early age is often a positive effect because they have the opportunity to practice! 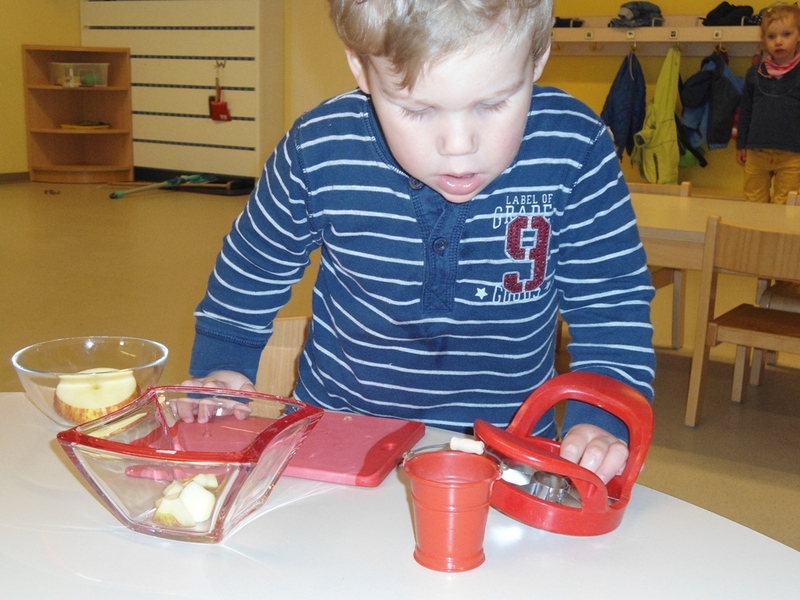 For us it is important that the children can get to know their body and bodily functions better and this concept supports and aids them on their way to independence.